Anyone, no matter how old, educated or well-read, will discover reasons to marvel at the newly opened The Mind Museum at Bonifacio Global City—the first world-class science museum in the country. Mt. 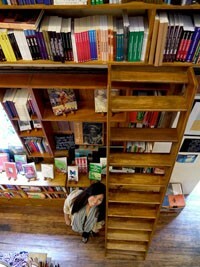 Cloud Bookshop is small but spacious, with a couple of inviting armchairs that double as shelves. For those who prefer the floor, there are throw pillows here and there. The wood paneled walls are decorated with several framed paper cuts by Sinag de Leon-Amado, and other colorful crafty pieces. Almost every corner has something interesting to look at, and it's no wonder that time slips by unnoticed in the cozy shop. The Cultural Center of the Philippines or CCP is located in Pasay City and was opend in 1969 to promote and preserve the Filipino arts and culture. 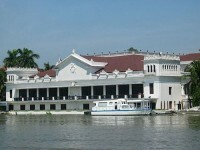 The Malacañan Palace, commonly known simply as Malacañang, is the official residence and principal workplace of the President of the Philippines. 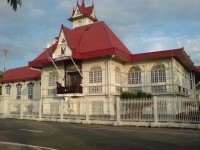 The Aguinaldo Shrine is the ancestral house of the first Filipino President, Emilio Aguinaldo. 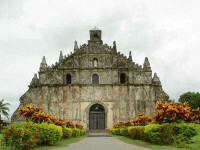 It is believe that this is the place where the first Philippine flag was raised to proclaim the independence from the Spanish colony. 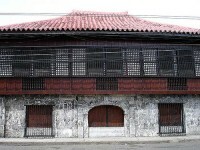 Casa Gorordo was built in the mid-19th century and bought by Juan Isidro de Gorordo. Four generations have lived in the big house including the first Filipino bishop of Cebu, Juan Gorordo. 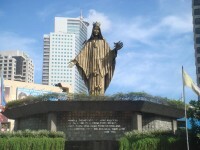 The EDSA Shrine or the Shrine of Mary, Queen of Peace is a small church located along Oritgas-EDSA. It has been a symbol of democracy and people power for the past decades. Museo Pambata is a children’s discovery museum with various programs in support of children’s rights and a broad range of creative and educational services for children and adults involved in children’s welfare.